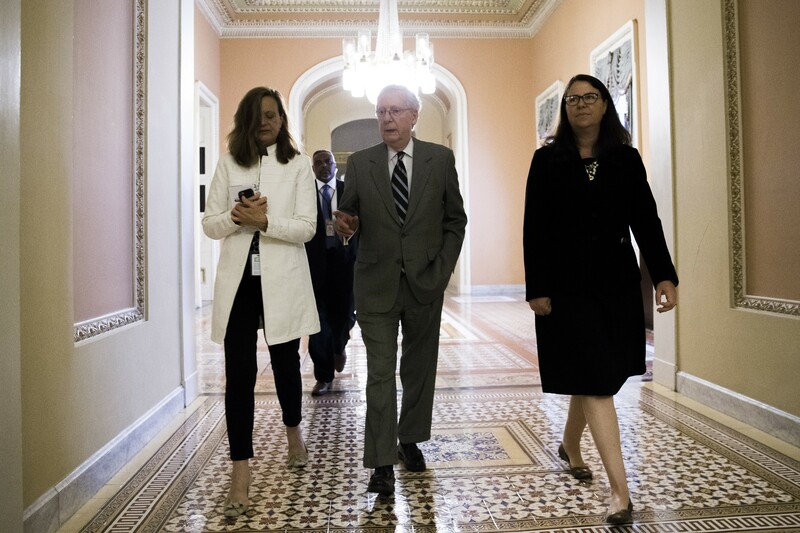 Senate Majority Leader Mitch McConnell (R-Ky.) walks with members of his staff on Capitol Hill in Washington, July 20, 2017. After seven months of deliberation, Republicans have reached the moment when they have to vote on repealing the Affordable Care Act, but they have yet to be told precisely what they will be voting on. The 51-50 vote came only a week after the Republican effort to dismantle a pillar of former President Barack Obama’s legacy appeared all but doomed. It marked an initial win for President Donald Trump, who pushed, cajoled and threatened senators over the last days to at least begin debating the repeal of the health care law. But even with that successful step, it is unclear whether Republicans will have the votes they need to uproot the law that has provided health insurance to millions of Americans. The Senate will now begin debating, amending and ultimately voting in the coming days on legislation that would have a profound impact on the U.S. health care system. For weeks, McConnell has been promoting and revising a comprehensive bill that would repeal the health law while also replacing it, but he has struggled to nail down the necessary support to pass that measure.